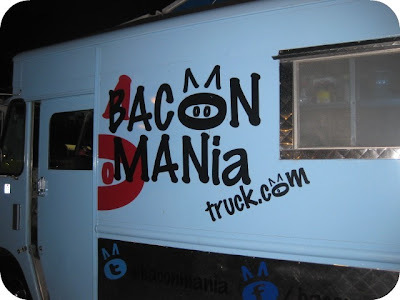 As a new addition to this awesome food blog I chose to start off with the Bacon Mania truck for my first review because honestly, when can you go wrong with bacon? I tried this truck a little over a week ago down in Brea where they have a weekly Friday night food truck event in a Best Buy parking lot. I immediately gravitated towards this truck not only because of its bright blue paint and cute insignia but also because of the mass amounts of people that were in line waiting to order. There really can be no better compliment than a swarm of people wanting to eat your food. Anyways, after assessing the menu and having a really fun conversation with the cashier, I didn’t hesitate on the option of their…wait for it… bacon macaroni and cheese. The first bite of this dish, which on their menu is known as the Mac’n Bac’n, made it the whole 15-mile drive I took completely worth it. The whole base of the pasta was creamy with a custard-like texture and the noodles were cooked perfectly. Now, people can be picky about how they like their bacon cooked but I prefer mine to be a little soft and that’s what I received with this meal. The bacon was tender, chunky and in no small amount throughout the macaroni. To top off the dish they put a tangy, creamy (I’m just going to guess Chipotle) sauce on top to give it that extra kick with the sharp cheddar cheeses that were used. It’s not clarified on the menu what’s in the sauce but it definitely pairs well with the mild flavor of the macaroni and the saltiness of the bacon.The most difficult part of this experience was trying not to eat it in less than 45 seconds. You literally cannot stop shoveling that cheesy creation into your mouth. I recommend this truck to anyone out in the Orange County or Anaheim area since that’s where the truck usually sells food. However, in my case, I’ll be traveling the 25 minutes down the 57 freeway again so that I can hand over all my money and try everything on that menu.